Today, bringing a whole new meaning to the winter blues, on my East of Malaga Facebook page we are celebrating the “Málaga Blues”. This is a series of photographs taken around Málaga province, showing skies, sea and doors in various shades of blue. 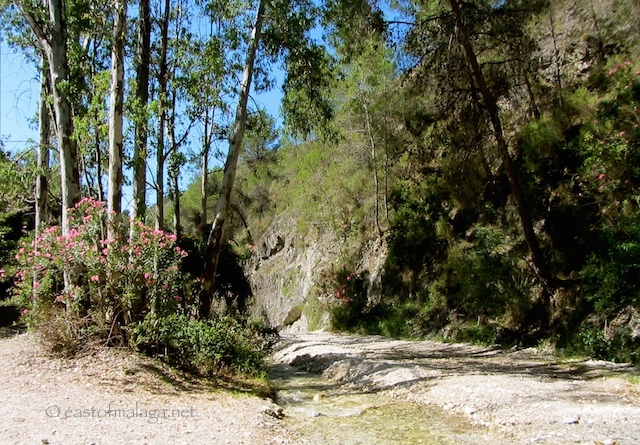 One of the best ways to cool down on a hot summer´s day is to take a walk along the Rio Chillar from Nerja. 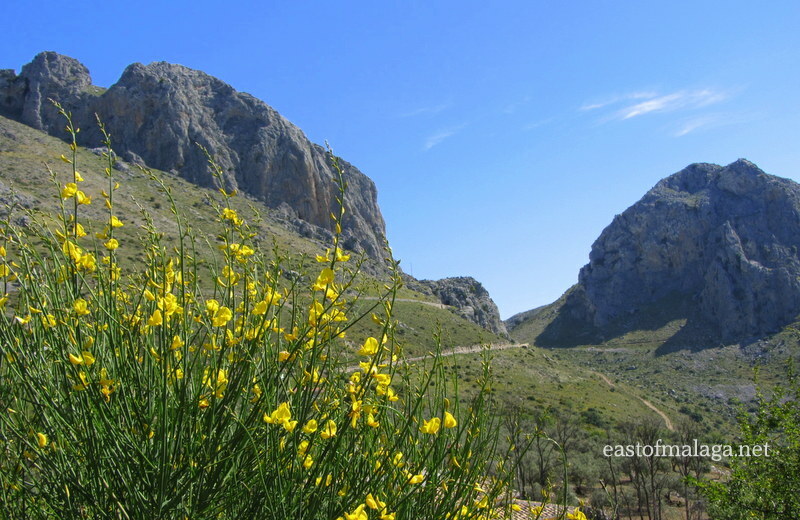 Unusually for Andalucía, this route is suitable for walking during June, July and August, as there is plenty of shade, plus the river to keep you cool. Closer to Frigiliana in terms of distance, this mountain hamlet is a world away from the hoards of holiday-makers visiting the Costa del Sol. You can discover this delightful blue door in the Lost Village of El Acebuchal. Held every year in August, the Málaga feria is one of the largest fairs in Spain with millions of people joining the fun throughout the week. In 1979, a cave was discovered near to the Zafarraya Pass, with a subsequent archaeological dig unearthing the best preserved remains of Neanderthal man (radiometrically dating back 30000 years) ever found in Western Europe. 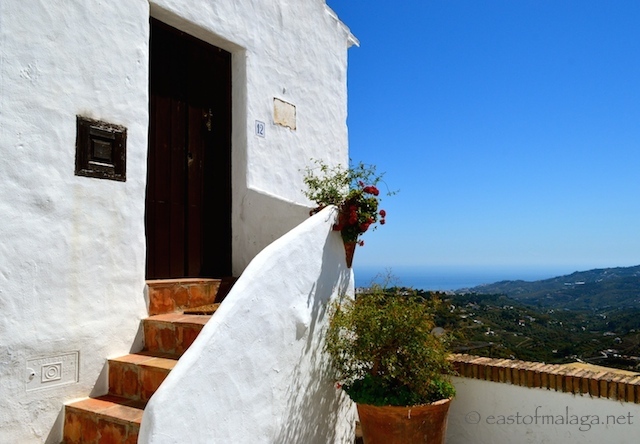 Could this be Frigiliana’s own “Stairway to Heaven”? 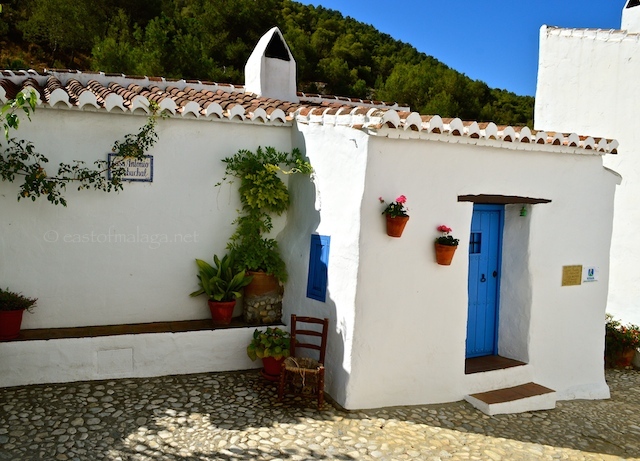 This house with it’s heavenly views can be found in the upper part of the white village of Frigiliana. There is no motor vehicle access up the steep streets to this part of the village, which remains largely how it must have looked hundreds of years ago, when the village was occupied by the Moors. 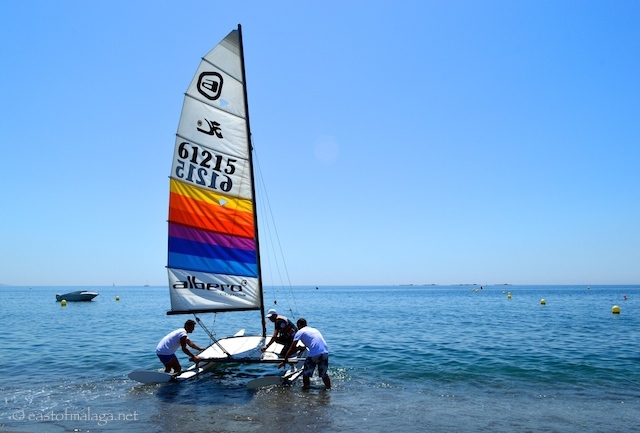 Last summer I had fun photographing the colourful sails of the catamarans at the sailing club in Torre del Mar. Lying in the shadow of the largest mountain in the Axarquía region, there has been a settlement on the site of Canillas de Aceituno since the Moorish occupation in the 8th century, when the main industry was the growing of mulberry trees for silk production. 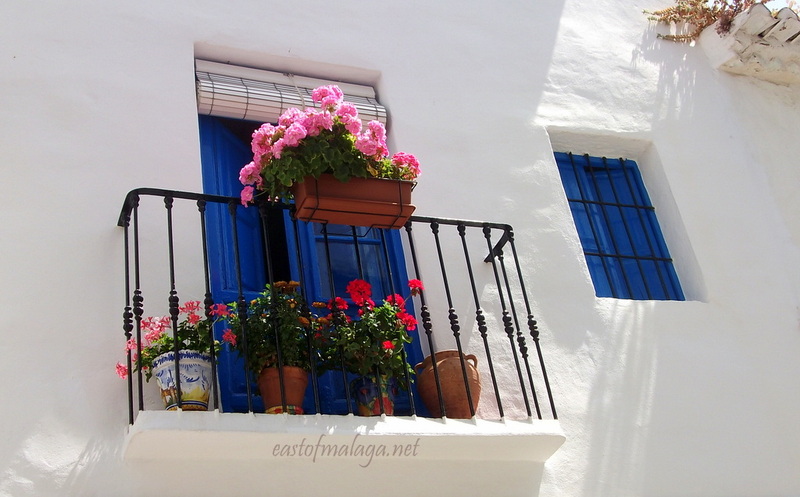 My final image is from my home village of Cómpeta, showing a pretty balcony, filled with flowers, against the deep blue painted windows as their background. Head over to Facebook, join in with the fun – and post your own Malaga Blues onto the page, if you have any! This entry was tagged Andalucía, Cómpeta, East of Malaga, Europe, Malaga, photography, Spain, travel. Bookmark the permalink. Fabulous photos as usual, Marianne. I am pretty sure I have one for your FB page. Must look. I am definitely going to be in your neighbourhood in September for a few weeks and will keep you posted on the details. We may get to meet in person after all! Stunning images as always Marianne! I needed this post Marianne of my most favorite color! How beautiful to be filled with sunshine from your blog while buried in snow! The white washed houses are so much more appealing than this snow! Sigh…. Thank you for this lovely shot of blue sky and sunshine! In Victoria today it is very grey – all mist and drizzle. Your photos are food for the soul! …but Victoria is SUCH a pretty place to be. Hope you are soon throughout the mist and drizzle! Hi Marianne. I’m so happy you’re back! How’s your mum? Tell her to take a break from the blues of British winter and come here. Hi Serena – I’ve managed to keep my FB page going – but I seem to have got out of the habit of writing for the blog, don’t I? Sorry about that – I do miss writing. I have so many ideas for blog posts spiralling around in my mind 🙂 My Mum is doing really well – thank you for asking. Lovely! I am thinking I need to visit this region…..
Tee hee…. OK, tell me the 3 most important places I need to visit ( or 6, if you prefer)… Most important means places, preferably not the most well known, that are interesting, or picturesque, quirky… I’m interested to see where you would suggest. 1. 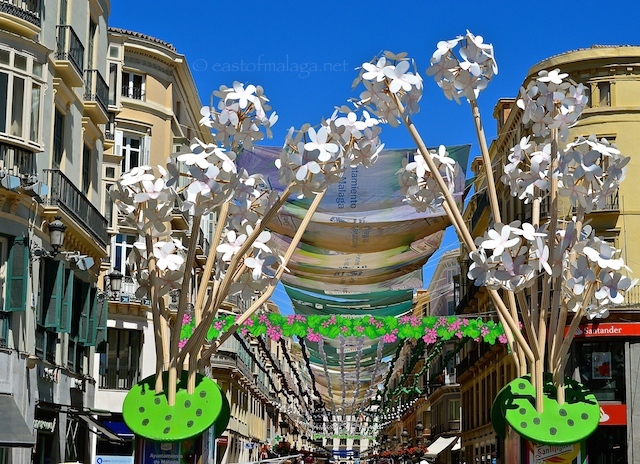 Malaga city – has come on in leaps and bounds over the past ten years. It’s listed on many world hotspot lists for 2015. 2. 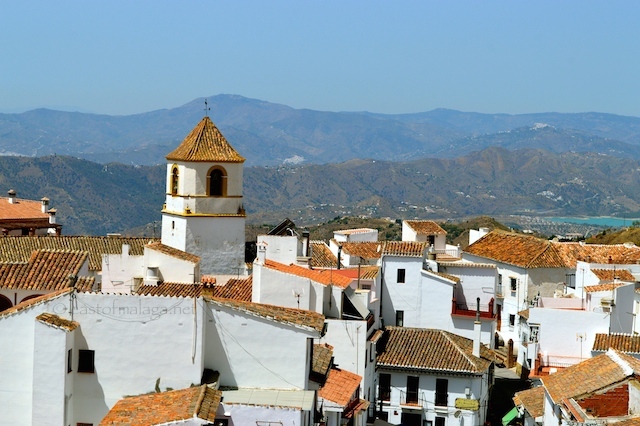 Staying east of Malaga – Frigiliana – has been named prettiest village in Spain – old Moorish village with stunning views down to the sea and up to the mountains. (you could then pop down to the nearby town of Nerja). 3. I think the capital of the Axarquia, Velez-Malaga, is a very interesting town – it’s VERY Spanish but has loads of fascinating places and some great restaurants. You could then make a dash to the coast from there to the “seaside” part of Velez-Malaga – known as Torre del Mar … foodie heaven, great promenade and lots more. Ah, thanks, I shall do a bit of looking up on the map! Well, if I did get over that way, I would hope we most definitely would meet up! Fabulous Marianne, makes me feel all summery! Gorgeous pictures. Such a lovely part of the country.